No more boring green beans! 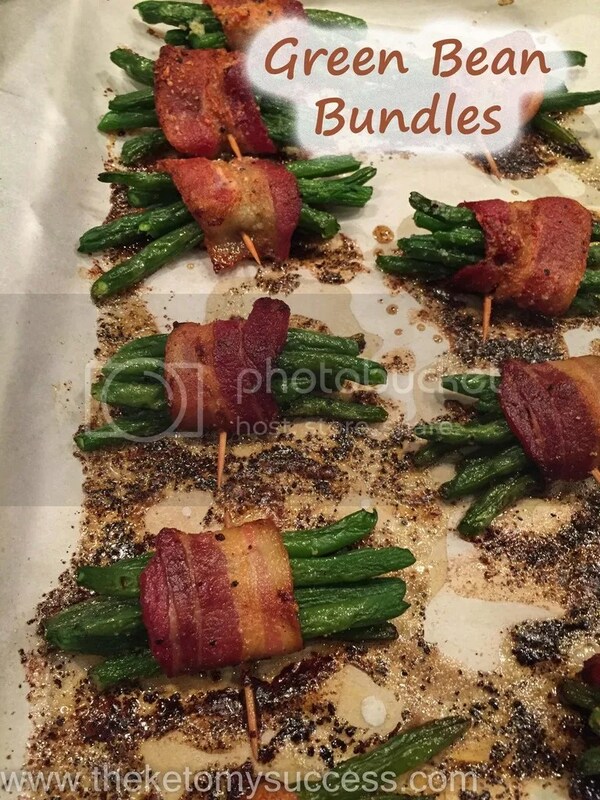 Bacon wrapped green bean bundles take it up a notch for a special meal. These are easy to make, have just a few ingredients, and pack a lot of flavor. The garlic butter drizzle takes them over the top! This is definitely going on our Thanksgiving menu! The perfect accompaniment to any holiday table. In a large nonstick skillet over medium heat, cook the bacon. You want the bacon to begin to brown along the edges but will be very underdone and pliable. Transfer to paper towels to cool. Once cool, cut each slice in half. In a bowl, whisk together the melted butter, salt, and garlic powder. Divide the green beans into 16 equal portions, about 6 green beans per bundle. Gather each portion into a neat bunch and wrap a half slice of bacon around the center. Use a toothpick to skewer the bacon together. Place seam side down on the lined baking sheet. Once all the bundles are done, drizzle the garlic butter over each one to coat. Place in the oven for 20-25 minutes. This is by far my new favorite side dish and it is perfect for Thanksgiving. It is very much the Keto version of the classic broccoli cheese rice casserole, likely found at many an Indiana Thanksgiving table. The, aforementioned classic recipe, was full of processed cheese and canned soups. This version is made of “real” food and you can really taste the difference. It was always one of my favorite accompaniments on Turkey Day…this version might be even better. We will be heading to Thanksgiving with my wife’s family this year. Her family always has a good time together. There will be lots of family; aunts, uncles, cousins, babies, and the matriarch of the family, Grandma Betty. We will eat some great food and then head out to the pasture to shoot some guns and blow stuff up. Something to be thankful for. Let me know if you try it out and how your family likes it. Happy Thanksgiving! This is hands down my favorite side dish. Perfect for the holiday table! In a medium bowl, combine mozzarella cheese, almond flour, and coconut flour. Mix well. Stir in the melted butter. Spread the mixture out on the parchment, forming a thin rectangle shape. Bake for 20-25 minutes, watching to ensure it doesn't get too dark. It will crisp as it cools. Reduce oven temperature to 350F. Grease a casserole dish. If using fresh broccoli, boil for about 4 minutes. Transfer to a colander and rinse with cold water to stop the cooking process. If using frozen, cook for 5-6 minutes to thaw the broccoli. Once cooked, place in a large mixing bowl. In a large saute pan, melt 1 tbsp butter over medium heat. Add the chopped mushrooms and onions and saute until soft, stirring occasionally. Transfer mushrooms and onions to the broccoli bowl. In the same saucepan, melt 4 tbsp of butter. Whisk in the xanthan gum until completely incorporated. Slowly whisk in the heavy cream and chicken stock. Simmer until it thickens. Remove from heat and add the sour cream, salt, and pepper. Pour the sauce over the vegetables. Add the cheddar cheese, egg, and half of the crumb topping. Stir to combine. Transfer to the greased casserole dish. Top the casserole with the reserved ½ cup cheddar cheese and bake for 45 minutes. Top the casserole with the remaining crumb topping before serving. I recently had some of my fellow Virta participants over for a day of Keto cooking. I prepared this cheesecake pie the night prior, not sure how it would turn out. Everyone really enjoyed it! One of my friends said that they thought that the coconut flour crust tasted just like the real thing. Could there be a better compliment for a keto cook?! The moral of the story is we CAN have a normal Thanksgiving holiday! With a few tweaks to these traditional recipes, they can be adapted to fit within our nutritional parameters. We can be a part of the holiday traditions with our families without jeopardizing our progress on the plan. I have been asked recently why I try to adapt recipes and just don’t give up on these foods. My personal answer is that this way of life wouldn’t be sustainable (FOR ME) if I could never have anything sweet again. Again, I am only speaking for myself. When going from a traditional diet to a ketogenic one, you do have to eliminate certain foods. When you find substitutions that work and do not jeopardize your blood sugar, why not enjoy them. This is a must have dessert this Thanksgiving! 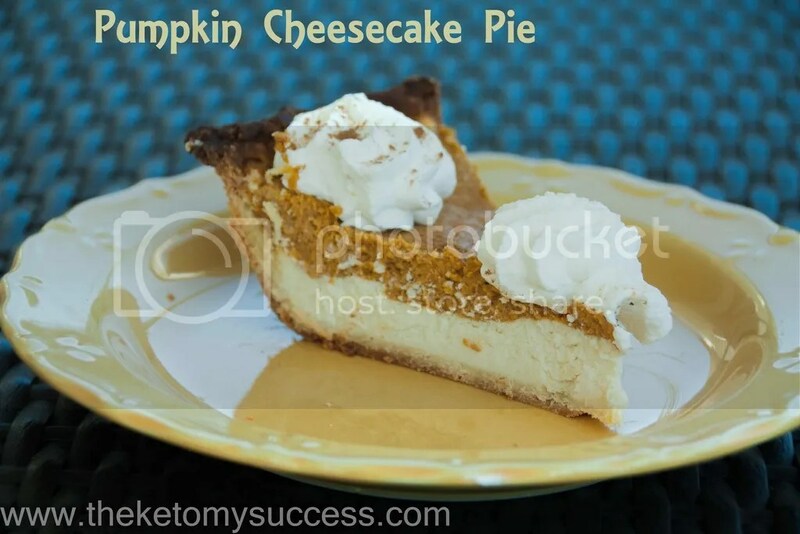 Cheesecake and pumpkin pie are a delicious combination!. In a food processor, combine the dry ingredients. Pulse to combine. Next add the eggs and cut butter. (Make sure that the butter is VERY COLD.) Pulse to combine until it forms a ball of dough. Place between two pieces of parchment paper and roll it out. Place in a 9-inch greased pie pan. Place a piece of parchment on top of the pie crust. Add dry beans or ceramic pie weights to avoid bubbles from forming on the top of the crust. Remove and let cool completely. Reduce oven temperature to 325F. In a small bowl, beat the cream cheese and Swerve until fully combined. Add the vanilla and eggs, beat until smooth. Set aside. In another bowl, combine pumpkin, heavy cream, Sukrin Gold, spices, and egg. Beat on low speed until blended. Pour cheesecake mixture into the prepared pie crust. Gently spoon the pumpkin mixture over the top of the cheesecake. Cover edges of the pie crust with aluminum foil to prevent burning. Cool 30 minutes then refrigerate at least 4 hours prior to serving. Oh my goodness! Are you ready for the ultimate appetizer for a party or holiday function? This is it. This dip is so delicious and versatile. 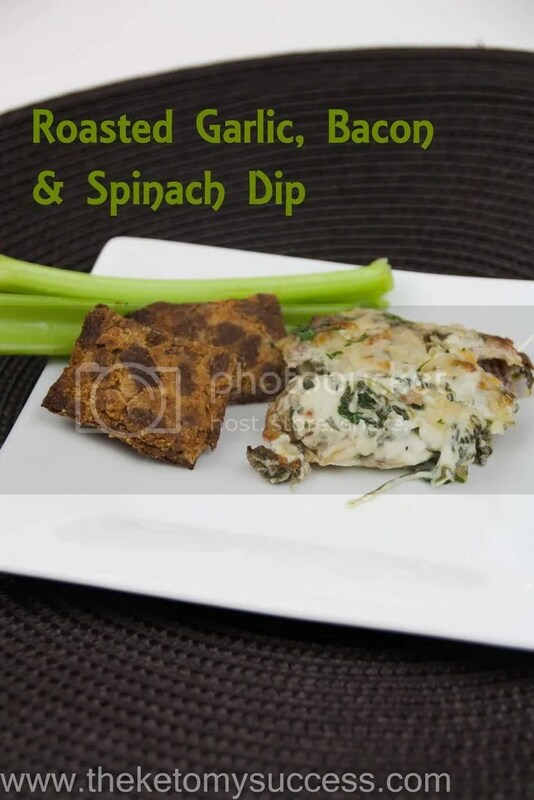 We have put this out as a dip with keto crackers and veggies, stuffed it in button mushrooms, and smeared it on baked chicken. This is one of the dishes that keto and non-keto eaters alike will devoir. I made this when we had some friends at our family lakehouse this summer and it was gone in a matter of minutes. Why? Because keto food is delicious! This dip is no exception. Place bacon on a cookie sheet and bake in the oven until crisp, about 20-25 minutes. Set the bacon on paper towels. Transfer bacon grease to a small bowl for use later. In a large saute pan, add the spinach to the reserved bacon grease and allow to wilt completely. In a medium mixing bowl, add all the ingredient together. Mix this until fully combined. If using immediately, place the desired amount in a ramekin or oven safe dish. Sprinkle with parmesan cheese and bake for 25 minutes. Broil for an additional 3-4 minutes for a browned topping. Fall is here and this guy couldn’t be more excited. This is my favorite time of year. The air is crisp, the temperatures drop slightly and I get to mow my yard less frequently! Oh and all the fall comfort foods are in abundance. I just stop by Trader Joe’s today and there was pumpkin items in every aisle. I have started to put together a few fall recipes to share with you. 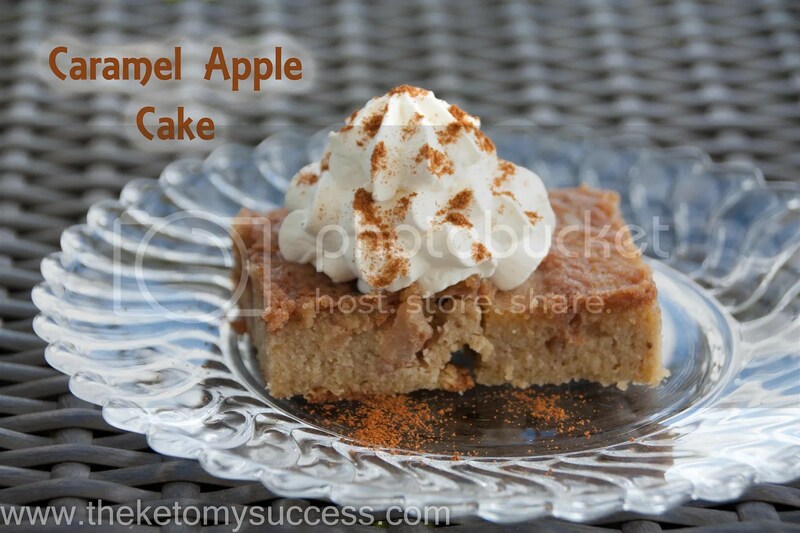 This Caramel Apple cake is amazing! I think I have perfected how to get jicama to taste like an apple. The trick is to microwave the jicama! This gives it the right texture. Add in a couple of the warm, fall spices like cinnamon and nutmeg and you have a real winner. My oldest boys just joined Cub Scouts and we went on our first camp outing. I was nervous I would feel left out at the campfire while everyone was enjoying their ooey gooey, sugary s’mores. I brought a little of this apple cake and was completely satisfied. I got to have a sweet fall treat too without jeopardizing my blood sugar! I hope that you enjoy this recipe. Preheat oven to 325F. Butter a 9x13 inch baking pan. For the apple mixture, finely dice the jicama. I chop it into small pieces and then pulse it in the food processor. Place a cup of the jicama in a microwave safe bowl and cover with plastic wrap. Microwave the jicama for 10-15 minutes. This will get it to the correct apple texture. Place the jicama in a small saucepan. Add the cinnamon, nutmeg, apple pie spice, Sukrin Gold and butter. Simmer for about 5 minutes to combine the flavors. *I typically get about 3 cups of "apples" out of a large jicama. It can be prepared and frozen for later use. In a large bowl, mix melted butter with Sukrin Gold, vanilla and stevia extract. Add almond flour, cinnamon, and apple pie spice; stirring to incorporate. Add in eggs, sugar-free caramel syrup, sugar-free brown sugar/cinnamon syrup and stir until all ingredients are well combined. Pour batter into prepared pan and spread the top. Add the "apple" mixture dolloped on top of the batter. Using a spoon, swirl mixture to make sure the top is covered with the apples. Bake for 25-30 minutes or until top is golden brown and firm to the touch. Remove from oven and let cool completely in pan. For the glaze, mix all the ingredients together in a small saucepan over medium low heat. Let the mixture simmer, continually stirring for 4-5 minutes. The sauce will thicken slightly. Once the cake is cooled, top with the glaze, using an offset spatula to completely cover the cake. School is in session and boy is it crazy around here! My oldest two boys just started Kindergarten and my almost four-year olds are in Pre-K. Time is flying and where did the summer go?! Speaking of summer, I have been working on getting a good, low-carb donut recipe. My hometown has the best donut spot, Tom’s Donuts. Everyone I know thinks they have the best donut shop but really….Tom’s is the BEST!! We always go and get some for the kids when we are up at our family’s lake house. Truth be told, it is the one thing that I have the hardest time resisting. Now I don’t have to rely simply on will power…the inaugral donut recipe is coming at you, below. My wife’s favorite donuts are apple fritters and sour cream donuts, so I decided to work on the sour cream donut first. These are fantastic! I had the kids try them and they were big fans! They inhaled the first donut and begged for another for dessert and then again for breakfast the next morning. Honestly folks, these kids are picky and I don’t get victories like these often. I will take them where I can get them. If I can give them something low-carb and sugar-free for breakfast or dessert and they don’t press us for the sugar-laden version… I will call it a W! I’ve tried my hand at putting together a video for this recipe. If people like them, I will try to do more. Please post your candid comments below. I was a little nervous about it but hope that you find it helpful. 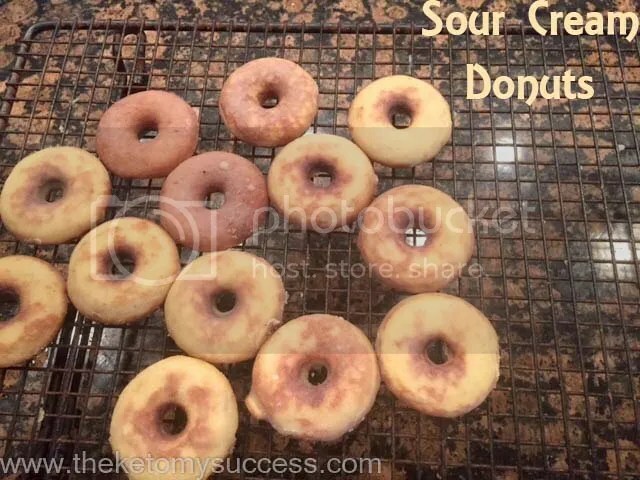 You can use a donut pan for use in the oven or a mini donut maker. If using the pan, preheat the oven to 350F. If using the donut maker, plug in and fully preheat. In a stand mixer, combine the sour cream, heavy cream, eggs, olive oil, and vanilla extract. Stir to incorporate all ingredients. In a separate bowl, mix the dry ingredients together. Slowly add the dry ingredients into the wet ingredients in the mixer until fully combined. Transfer the batter to a ziplock bag. Snip a small whole in the corner of the bag. You now have a piping bag. Pipe the batter into the donut molds. If using the oven, bake for 15 minutes. If utilizing the donut maker, bake according to the directions on the machine. My machine (shown below) bakes for 4 minutes. Allow the donuts to cool completely before glazing them. In a small saucepan, melt the butter over low heat. Whisk in the powdered sweetener, heavy cream, and extract. Allow the glaze to cool slightly and thicken before dipping the donuts. 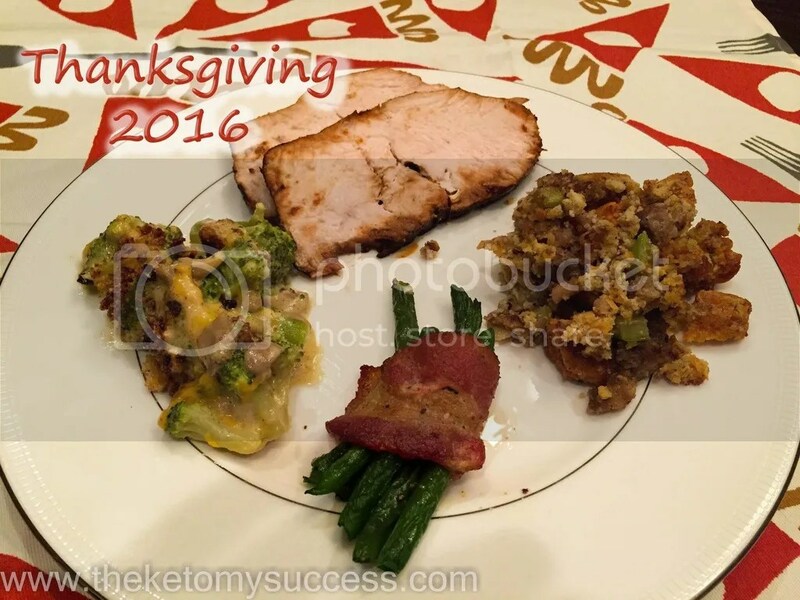 As I sit down to write this post, it hits me that I have been living a ketogenic lifestyle for a full year this week. What was I doing one year ago? I’ll tell you… I was lying to myself. Lie #1: I don’t have diabetes. Yes, I did. I wasn’t checking and had moved from prediabetes to full blown Type II. Lie #2: I eat healthy and work out regularly. Reality: I was a carb-aholic and worked out sporadically. Lie #3: I am happy. I was as happy as I knew how to be at that time. Now that I am healthy, I know happiness in a different way. I am not constantly worried about my cholesterol and family history of heart disease. I now look forward to growing old with the love of my life and being there to know my grandchildren. This was me in June 2015. I love this picture and especially the people in it. This was a special day for Elliott and Hudson as they graduated Pre-K. This is hard to admit. When looking for a picture from a year ago, I noticed something about myself. I hid behind people. I posed a certain way in photos to try and not bring attention to myself or my weight. Maybe people won’t notice me if I pile the kids on my lap. I shouldn’t have been ashamed. I was, for the most part, following the dietary guidelines that were laid out for me; for all of us. The truth is my body cannot tolerate high carbohydrate foods. This was my past. This is a picture from 2016. We have both lost weight but more importantly, we have changed our overall health. I know that I am living a healthier lifestyle and don’t need to worry as much about my mortality. My dad was in his mid-fifties when we lost him. I don’t know that I will ever eliminate the fear completely but I know that I am doing everything in my power to reduce the risk. The best part about going keto is the food. You don’t have to give up everything you love, just reformat it. Check out the cupcake recipe below. We will celebrate our healthy lifestyle by enjoying a yummy cupcake! Onto the dessert of the summer! This cupcake combines all the great produce of summer into a delectable dessert. Some people find coconut flour baked goods to be dry. 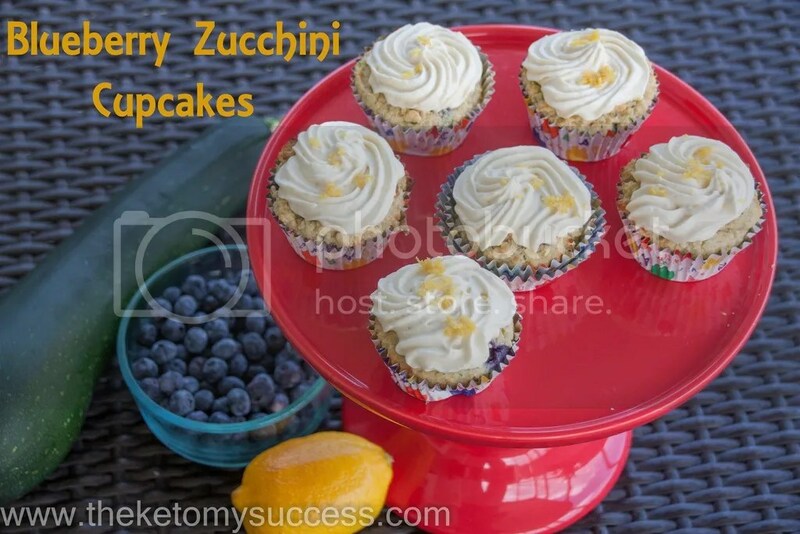 These are anything but because of the zucchini and blueberries. Top it all off with lemon cream cheese frosting….how could you go wrong?! Preheat the oven to 325F and line a muffin tin with cupcake liners. Heat the almond milk in a saucepan over medium heat. Split the whole vanilla bean lengthwise and scrape the seeds out with a sharp knife. Place the seeds and the vanilla bean pod in the warmed almond milk and bring to a simmer. Remove the milk from the heat and let steep for 30 minutes to fully infuse the vanilla flavor into the almond milk. Remove the vanilla bean pod. Using a food processor, shred enough zucchini to equal 2 cups. Using a kitchen towel, squeeze out as much water as possible out of the zucchini. Set aside for use later. In a medium mixing bowl, whisk together the dry ingredients: coconut flour, sweetener, baking powder and salt. With a hand or hand mixer, combine the eggs, melted butter, almond milk, and zucchini. Stir in the vanilla extract and liquid stevia. Slowly add in the dry ingredients, a little at a time until fully incorporated and smooth. Remove the batter from the stand mixer and gently fold in the blueberries. Using a 1/4 cup scoop, fill each muffin cup and bake 20-30 minutes or until the tops are set and a toothpick comes out clean. Let the cupcakes cool completely. In a medium mixing bowl, combine the room temperature cream cheese and butter, heavy cream, Swerve, stevia, lemon zest, and lemon juice. Mix with a hand mixer until completely combined and smooth, about 10 minutes. Once the cupcakes are completely cooled, pipe the frosting on and enjoy! Hey Indy folks! Have you been to Georgio’s right off the Circle downtown? I love it. Haven’t had it for a while but I was thinking about those delicious pepperoni breadsticks. 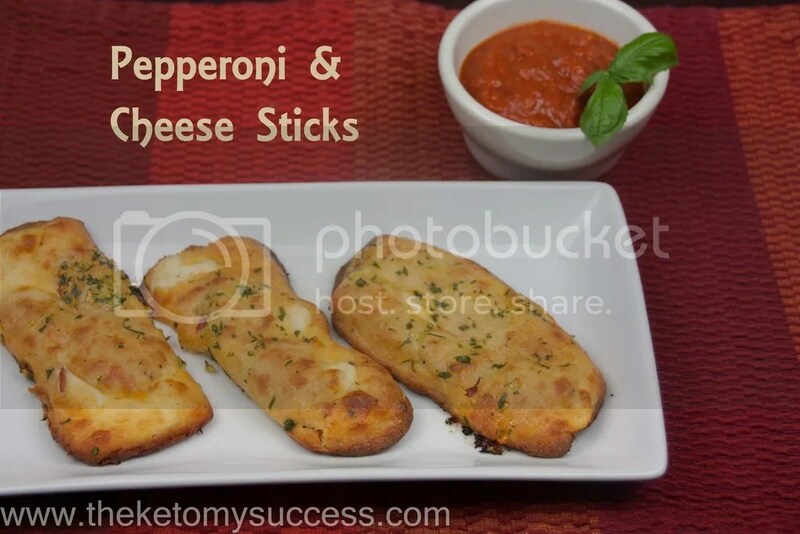 Is there a way to Keto-fy breadsticks? Yes, yes there is. I, again, used the Fat Head Pizza Crust recipe as the base for these sticks. I rolled out the dough and loaded them with spicy pepperoni and a stick of string cheese (stolen from the kid’s stash in the fridge…Shhhh!) All you have to do is roll them up and slather them with garlic, parsley butter. Oh so good! If you are looking for a change of pace, these are the ticket. Dip them in your favorite low-sugar pizza sauce and you are set! Pepperoni breadsticks got nothing on this Keto version. Dip them in your favorite low-sugar pizza sauce and you have a fantastic appetizer or dinner. In a microwavable mixing bowl, combine the mozzarella and cream cheese. Microwave on high for 1 minute. Stir and microwave for another 30 seconds. Add the egg, pizza seasoning, and almond flour to the cheese and mix gently. Divide dough into eight equal parts. Place each dough ball between 2 sheets of parchment paper and roll into a rectangle. Place five pepperoni and a string cheese on each square and roll them up. Place each stick on a baking sheet lined with parchment or a silpat. In a small microwavable bowl, combine the butter, minced garlic, and chopped parsley. Brush liberally on each stick. Place the sticks in the preheated oven and bake for 12-15 minutes or until brown. Let cool slightly before removing from baking sheet. Lionel Richie had it right when he wrote the lyrics to The Commodores’ classic, Easy. For those of you on the Virta program, did you watch “The Virta Perspective” panel with Dr. Britt Volk, Dr. Sarah Hallberg, and Dr. Stephen Swinney? I have been on the Virta program since September 2015 and this video was really what I needed at this stage in my journey. So often, we get bogged down in the weight loss, or in my case recently, lack of weight loss. The truth is that it doesn’t really matter in the long run. We should celebrate our victories on the scale as well as those that are non-weight related. What are some of my non-weight related victories? #1. I feel great and have more energy. #2. I have essentially reversed my Type II Diabetes and am off all of my medications. #3. My cholesterol is on target. My HDL is up, LDL small particle and Triglycerides are down significantly, and the inflammation in my body is well below normal. Life is good. The words, “I want to be high, so high; I want to be free to know; The things I do are right” have new meaning in my life. People sometimes question the choices we have made living this lifestyle. We know and have tangible proof that we are saving our lives by making these choices and need to constantly share and celebrate all of our wins. 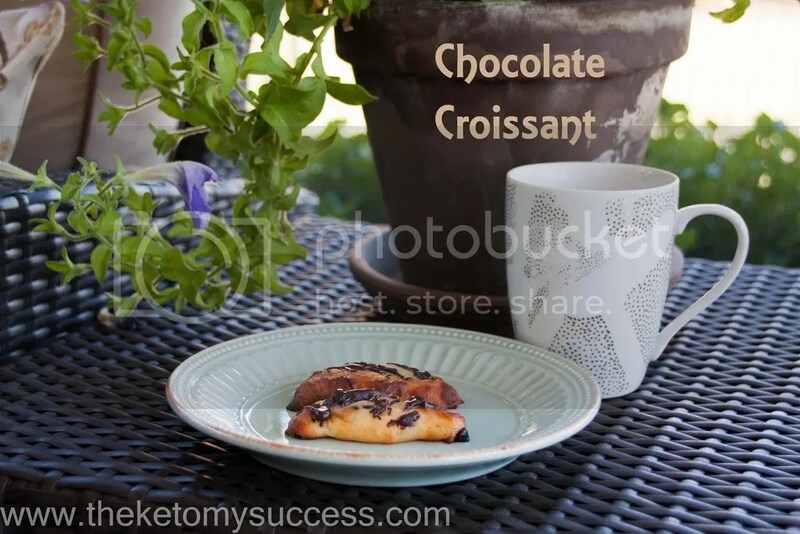 I decided to post this Chocolate ‘Croissant’ recipe before some other posts because I thought it would be great tomorrow morning. When we are home, we love to sit in our screened-in porch on Sunday morning. A piping hot cup of coffee and a chocolate croissant….could it get any better? I was cruising through Pinterest, as I often do, looking for inspiration. I found a recipe that used Pillsbury Crescent Rolls as the base for the chocolate croissants. I instantly thought that I could make it Keto friendly. I used the Fat Head Pizza Crust recipe from our friend Libby at Ditch the Carbs, as the base. The dough is really the most versatile thing I have found. I added a little bit of sweetener to the crust and voila, a sweet pastry crust. Please give these a try. I thought they were really good and the kids all loved them. I made them myself this time but it would be a really good recipe to have the kids assist. I am sure that they’ll love to help with the chocolate chips! What could be better on a Sunday morning on the porch than a chocolate croissant and a hot cup of joe? Check out my grain-free, sugar free, keto version. Add the egg, sweetener, and almond flour to the cheese and mix gently. Divide dough into four parts and then divide each 1/4 into 2 smaller balls. Place each part in between 2 sheets of parchment paper and roll into a rectangle. Cut the rectangle diagonally so that you end up with two triangles. Place about 15 chocolate chips on each tringle and roll them up, to resemble a croissant. Place each croissant on a baking sheet lined with parchment or a silpat. Place the pastry in preheated oven and bake for 10-12 minutes or until brown. While you let the croissants cool or a cooling rack, start the chocolate drizzle. Place 2 tbsp. of the chocolate chips,butter, and stevia in a small microwavable bowl. Microwave for 30 seconds and then stir. Continue to microwave in 10 second increments until the chocolate is fully melted and smooth. Drizzle the chocolate over the pastries. It’s summer and what sounds better than cold, creamy, refreshing ice cream?! We are coming up on our big 4th of July weekend at my family’s lake house. It is in Northeast Indiana, where I grew up. The entire family loves venturing up during the holiday weekend for some fun in the sun, boating, and general relaxing. Whilst we are all focused on the fun I would be remiss if I didn’t identify the potential dietary pitfalls awaiting us if we don’t prep ahead of time. I think that it is interesting how many memories are tied to food. If you know anyone that has been to the lakes in Steuben County then I am sure you’ve heard of Tom’s Donuts. Donuts, Italian food, Acapulco, and yes, ice cream. In preparation for the trip, I’ve been playing around with some sugar-free, low carb alternatives for Megan and I to enjoy. The inspiration for this recipe came from some ice cream that I had last summer at Scoops. It was a vanilla ice cream with a blueberry ribbon and waffle cone pieces. It was delicious but laden with sugar and carbs. I am pretty proud of this creation. I used a Vanilla Bean Ice Cream as the base, added a fresh blueberry sauce, and some a chopped up Keto Waffle. Let me tell you, the maple extract and cinnamon in the waffle takes this combination to another level. We will definitely not feel left out when we take the kids for their Super Man ice cream cones. Bring it on summer! Keep with me. I will be adding more recipes in preparation for our week at the lake. This heavenly summer treat will let you indulge without jeopardizing all your hard work! 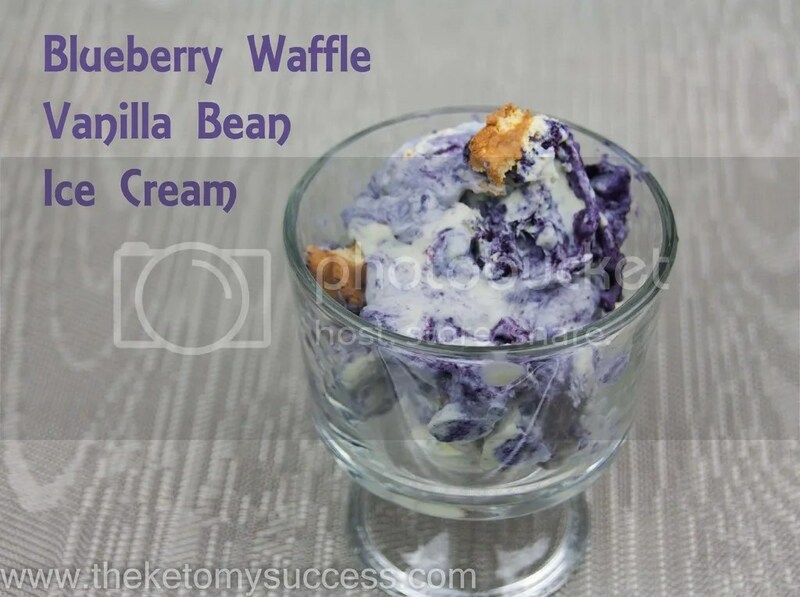 Vanilla bean ice cream swirled with a delicious blueberry sauce, and maple waffle bites. You will not be disappointed! Combine the heavy cream, almond milk, Swerve, and stevia in a medium saucepan over medium heat. Mix to ensure that the sweetener has blended into the cream. In another bowl, mix together the egg yolks. Slowly temper the cream mixture into the egg yolks, beating constantly. Pour about ½ cup of the cream mixture into the yolks mixing constantly so that the eggs do not scramble. Once the mixture has been brought up to temperature, pour the yolk mixture back into the saucepan with the remainder of the cream. Continue to whisk briskly until the mixture thickens to a custard. Take the custard off of the heat and add the vanilla bean seeds and sea salt. Transfer custard to a bowl and cover with plastic wrap. Refrigerate for at least an hour to cool the mixture before placing in your ice cream maker. Once the mixture has cooled, completely, add to your ice cream maker and follow the instructions for your machine. Once added to ice cream maker, you can add 2 tbsp of vodka to the custard. This will help the ice cream from freezing so hard and crystalizing. In a small saucepan over medium heat, add the sweetener, water and blueberries. Cook for 10-12 minutes. Continue stirring and breaking up the blueberries. Add the xanthan gum and whisk vigorously to fully incorporate into the sauce. The sauce will begin to thicken. Transfer sauce to a container and refrigerate until completely cooled. See my Keto Waffle. *The recipe makes 4 waffles. You will use one waffle for the ice cream. The waffles freeze really well so make the whole recipe and you’ll have breakfast the next day too! Layer half of the vanilla ice cream in the bottom of a container. Add half the blueberry sauce and half the chopped waffle pieces. Swirl the mixture. Repeat the next layer in the same manner. Freeze for at least 1-2 hours before serving.